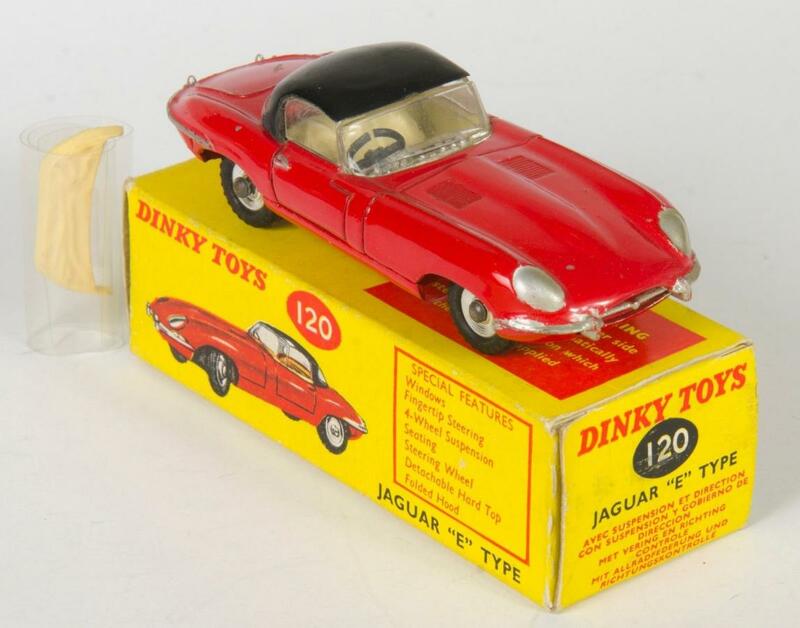 The genesis of Dinky Toys and Jaguar. 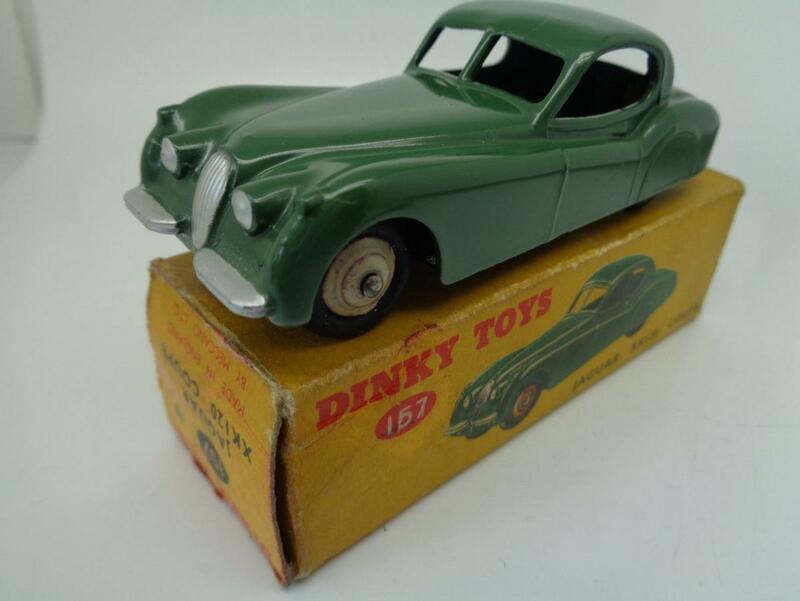 This Modelled Miniature Sports Coupé was one of the genesis of the Meccano Liverpool Dinky Toys range that became famous and has made so many kids happy all over the world. 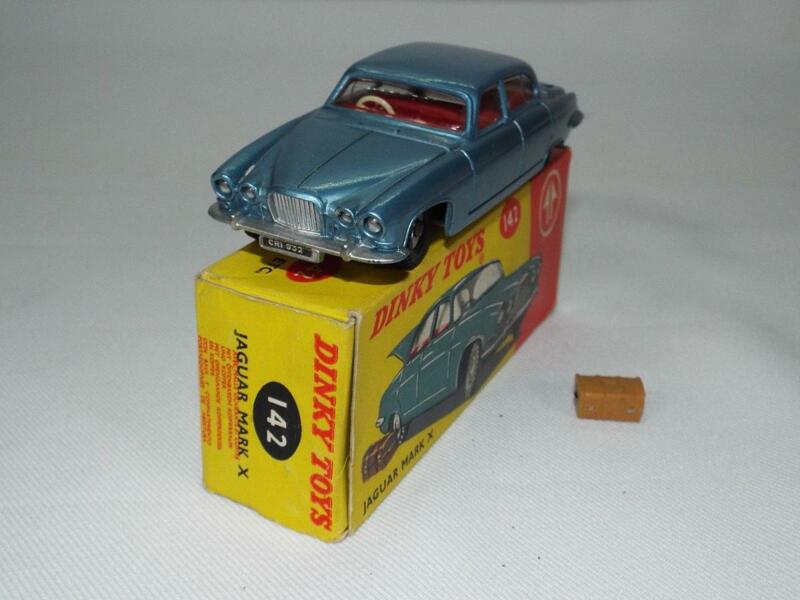 The Sports Coupé was part of the Hornby Series Modelled Miniatures No. 22 Motor Vehicles. 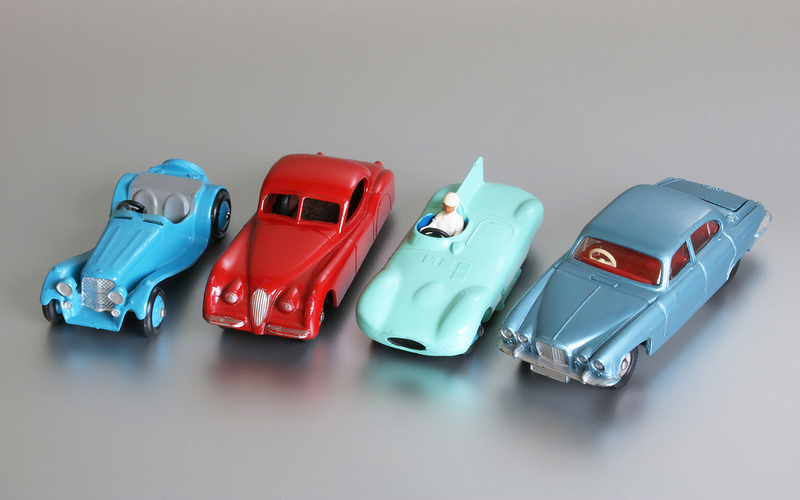 Set No.22 consisted of 6 motor vehicles: Sports Car, Sports Coupé, Motor Truck, Delivery Van, Farm Tractor and Army Tank. It was first announced in Meccano Magazine of December 1933 in which 3 new Modelled Miniatures sets for Christmas were promoted with the words: "On this page we illustrate three further sets that are particularly attractive, and we are sure that readers who do not possess these sets will lose no time in bringing their good points to the notice of parents, uncles and aunts, and other relations who may be expected to rise to the occasion at Christmas!" The 3 new sets were set No. 2 Farmyard Animals, set No. 21 Goods Train and set No. 22 Motor Vehicles. MM April 1933 with Railway layout with 4 road vehicles from the 22 series enlarged. Note: When I enlarge the picture I am counting 5 motor vehicles here. 1. Sports Car; 2. Delivery Van; 3. Sports Coupé; 4. Motor Truck; 5. ???? Which car is number 5? In my opinion it can't be the Sports Coupé, because those were all two-tone coloured and car number 5 is one-coloured. Was it an mock-up of a never issued model? It seems to me a very interesting question. There are more indications that series 22 was already finished in August 1933. In Hornby Book of Trains 1933-1935 with reference 16/833/100 (August 1933) Modelled Miniatures No. 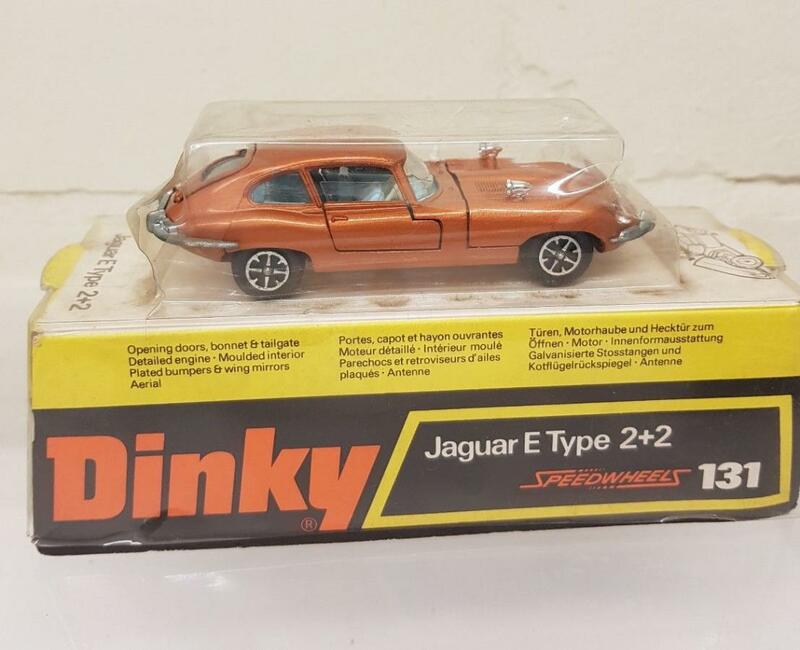 22 Motor Vehicles was on page 39 already depicted and advertised as Price per set 4 / - with the caption: The items in the above set may be purchased separately. No. 22 was for sale as a set for 4 / -. The motor vehicles did not yet get an individual sales number. The Sports Coupé was sold separately for 6d. The motor vehicles did not yet get an individual sales number. Hornby modelled miniatures were promoted in MM December 1933 as lineside accessories to the Railway layout with the slogan "Add Realism to your Railway"
For the first time, 6 motor vehicles were added to the Hornby Series range and were still called Modelled Miniatures. 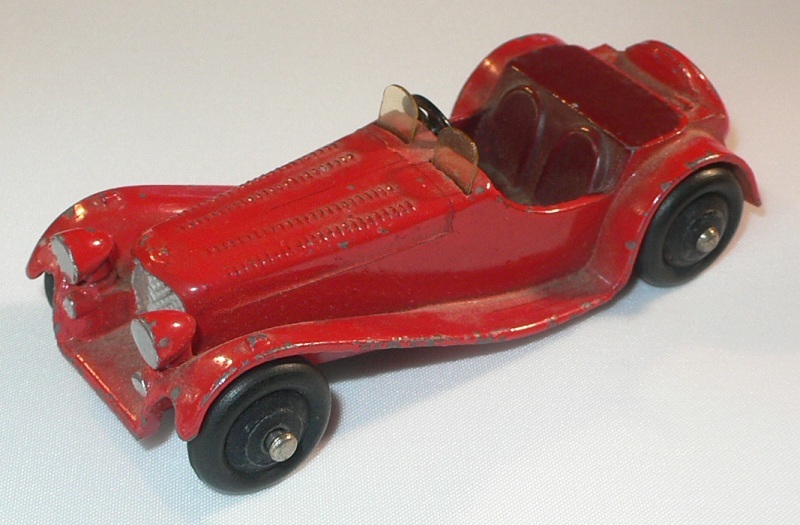 Sports Coupé with Hornby Series stamped to inside body. 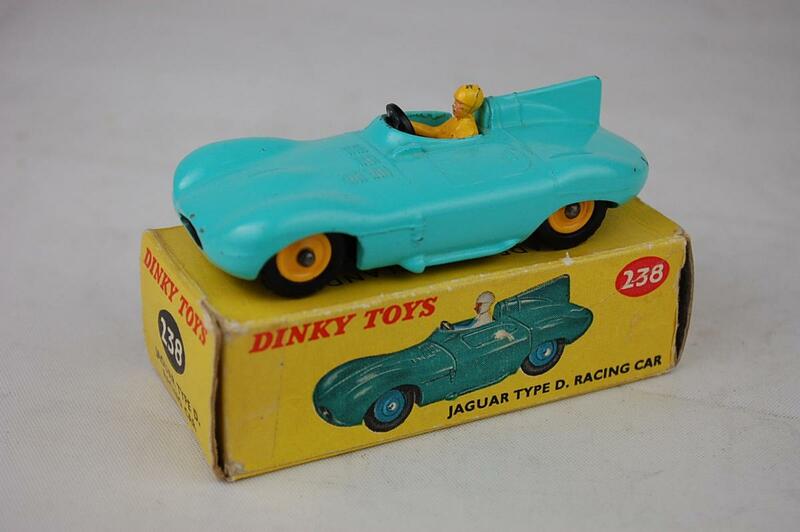 The later Dinky Toys 22b. De Sports Coupé of the Hornby Series No. 22 Motor Vehicles had on the inside of the roof stamped: Meccano Ltd Liverpool and on the inside of the hood stamped: Hornby Series. 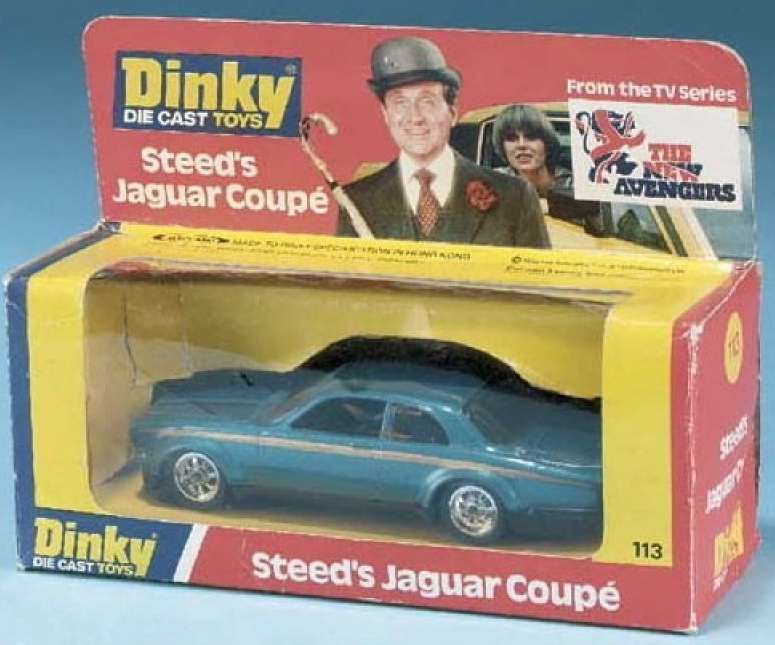 Note: It would be nice if members can add a photo of a Sports Coupé with Dinky Toys stamped on the inside of the body. It was not until MM April 1934 that Hornby Series set no. 22 Motor Vehicles were called as Meccano Dinky Toys No. 22 and all 6 motor vehicles were given their own sales number for the first time. 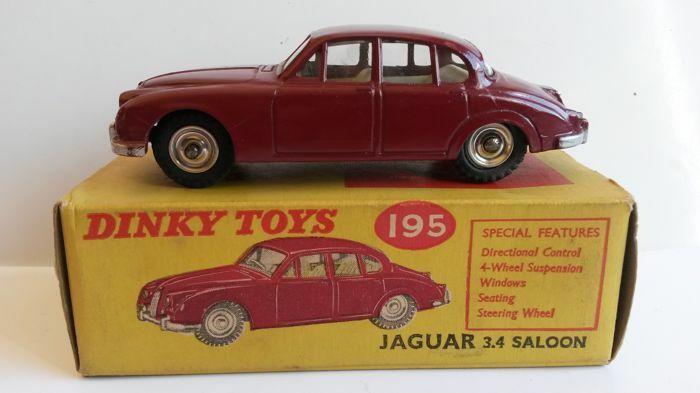 In the 3rd edition of John Ramsay's catalogue of British Diecast Model Toys is model 22b in parentheses referred to as SS Jaguar. This is not entirely correct. The brandname indication SS is correct, but the addition Jaguar was only used from 1935 onwards as a type designation for this type of car. Swallow Sidecar and Coachbuilding Company. It was the SS1 Sports Car of 1931 from the Swallow Coach Building Company at Foleshill Coventry England that was used by Meccano Liverpool as a prototype for the production of the Sports Coupé in 1933, later referred to as Dinky Toys 22b. The history of the production of the SS1 is very interesting and led to the development of the famous Jaguar cars. Meccano Liverpool did not use car brandnames in the beginning, but the Hornby Sports Coupé is unmistakably a reproduction of the SS1, made in 1931 by the Swallow Coach Building Company, of which William Lyons and Walmsley were the founders. In 1933 William Lyons founded the SS Cars Ltd independently and after WWII he changed the name SS Cars Ltd. into Jaguar Cars Ltd. for understandable reasons. So there existed before WWII already an indirect relationship of Meccano Liverpool with the later Jaguar cars. The SS1 of Swallow Coach Building Company of 1931 was in fact the forerunner of the Jaguar Cars, which were produced after WWII under the direction of William Lyons. It was this William Lyons who was the driving force behind Jaguar and was born on September 4, 1901 in Blackpool, a town in Lancashire, England. After working at the automobile manufacturer Crossley Motors Ltd in Manchester, whose chassis was used by the British government for military ambulances, personnel trucks and small trucks, he started working as a junior salesman at Brown and Mallalieu, a car distributor, but he was not happy there. Lyons met Walmsley in the early twenties, whose hobby was building sidecars for motorcycles. They agreed to jointly produce and sell sidecars. After a loan, they founded the Swallow Sidecar Company in 1922 in Blackpool. Soon the company gained a reputation for its sidecars, which were used during motorbike competitions. Things went so well that they had to move to Coventry and in 1928 the company was renamed Swallow Sidecar and Coach Building Company. With the move to Coventry, Swallow started producing bodywork for chassis from Fiat, Austin and Alvis. The Fiat-Swallow, with its two-door salon body, impressive radiator and two-tone colouration, was immediately a success and soon the company produced 50 cars a week. In 1929 the company unveiled its Standard Swallow; Two years later, brand new cars such as the SS1 and the SS2 (which could cruise at 50 mph) were introduced. The SS1 was the first own car model that was made by Swallow Sidecar and Coach Building Company. There was much speculation as to whether SS stood for Standard Swallow or Swallow Special - it was never resolved. The SS1 was a low-built, two-door, sports coupe that featured two passenger seats and room in the luggage box. In order to increase sales, Lyons encouraged owners of Swallow cars to enter motoring competitions. The first SS1 made its racing debut in the 1932 Torquay 1,000-mile rally. In 1933, Lyons bought out Walmsley and William Lyons founded SS Cars Ltd. The first SS 100 was introduced in 1935 and from that time started the introduction of the SS Jaguar range. After WWII the name SS cars Ltd was changed to Jaguar Cars Limited in March 1945 and the production of the "real" Jaguars began. All the series No.22 models were made of an alloy with a very high lead content so that they do not suffer from the fatigue problems of later production. Though most were only available for two years, the tractor and tank were not deleted until the war years. Note: I could find pictures of 6 different colours. May be members can add more pictures of colour combinations. 1946-1950: 38f Jaguar Sports Car. 1968-???? : Mini Dinky No. 11 E-type Jaguar. Made in Hong Kong. 1977-1979: 219 Leyland Jaguar XJ 5.3 Coupé en “Big Cat” Jaguar. Made in Hong Kong. 1978 : 113 Steed’s Jaguar. Not issued. 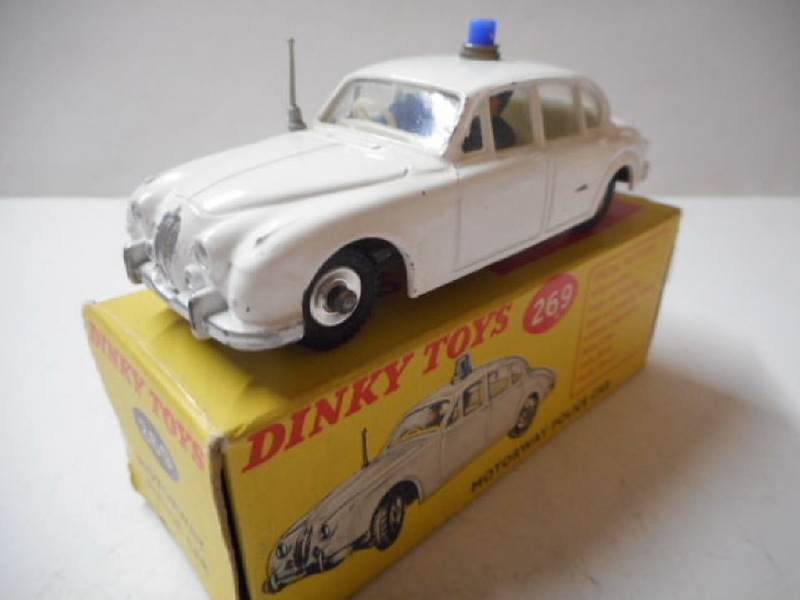 To complete my contribution I add a picture of each Dinky Toys model Jaguar listed above. Kind regards, Jan Oldenhuis, 5 September 2018. An impressive, well-documented contribution, Jan, with striking details and comparisons concerning the history of this very early Hornby / Dinky model (I will have to read it twice in order to fully appreciate all details). May I conclude that the models without photo credits are all yours? They are really great.